I bought this audiobook from Audible and used the Audible app on an iPhone to listen to it. What a great surprise. This book was recommended to me by Audible a couple of times before I finally took the bait. I think that it is narrated by John Hodgman was part of the draw for me. I don’t really like John Hodgman’s sense of humor, I have listened to excerpts from his book "The Areas of My Expertise", and didn’t find it funny, but as an actor I think he is great. And he does a fantastic job narrating this story. I am very tempted to rant about how much I despise the RIAA and the way they treat the people, or the ridiculous laws that have been passed in the last dozen years or so regarding music. But I am not going to do that, lets just say that I feel like this book expresses most of my feelings pretty clearly. This story is great fun, I recommend you read it as soon as you get the chance. Worse, they were lawyering up…. 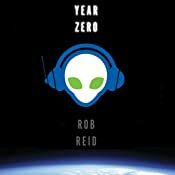 In the hilarious tradition of The Hitchhiker’s Guide to the Galaxy, Rob Reid takes you on a headlong journey through the outer reaches of the universe – and the inner workings of our absurdly dysfunctional music industry. The entire cosmos, they tell him, has been hopelessly hooked on humanity’s music ever since "Year Zero" (1977 to us), when American pop songs first reached alien ears. This addiction has driven a vast intergalactic society to commit the biggest copyright violation since the Big Bang. The resulting fines and penalties have bankrupted the whole universe. We humans suddenly own everything – and the aliens are not amused. Soon he’s on the run from a sinister parrot and a highly combustible vacuum cleaner. With Carly and Frampton as his guides, Nick now has 48 hours to save humanity, while hopefully wowing the hot girl who lives down the hall from him. I rate this book a 10 out of 10 for lovers of humorous science fiction and think the RIAA are a bunch of crooks. I bought this book from Audible and listened to it using the Audible app for iPhone. This is the second book in Mike Resnick’s Starship series. This book is much better than the first book Starship Mutiny, Mike Resnick’s sense of humor sneaks its way in, not as much as I would like, but it is present. Even though I found this book not quite in the same league as Santiago or Widowmaker, it is a good read. Captain Wilson Cole’s latest exploit saved millions of lives but embarrassed his superiors. He is a man with a reputation for exceeding orders but getting results. Cole has found himself the victim of a media feeding frenzy, a political scapegoat despite years of dedicated military service. Faced with a court martial, he is rescued by the loyal crew of his ship, the Theodore Roosevelt. Now branded mutineers, the crew of the Teddy R. has quit the Republic, never to return. Seeking to find a new life for themselves, Cole and comrades remake the Teddy R. as a pirate ship and set sail for the lawless Inner Frontier. There, powerful warlords, cut-throat pirates, and struggling colonies compete for survival in a game where you rarely get a second chance to learn the rules. But military discipline is poor preparation for a life of pillaging and plundering, and Cole’s principles limit his targets. Seeking an education on the nature of piracy, Cole hunts more knowledgeable players: the beautiful but deadly Valkyrie, the enigmatic alien fence David Copperfield, and the fearsome alien pirate known as the Hammerhead Shark. BONUS AUDIO: Includes an exclusive introduction by author Mike Resnick. © 2006 by Mike Resnick; (P)2008 Audible, Inc. I rate this book a 7 out of 10 and recommend reading it after reading Mike’s Santiago, Widowmaker, and Galactic Midway books. I bought this book from Audible and listened to it using the Audible iPhone app. The Starship collection of novels are Mike Resick’s go at military science fiction, it is along the lines of Honor Harrington. This book did not blow me away, it held my attention, but I am a big fan of Mike Resnick and I felt a little let down by this book. It doesn’t have the sense of humor or suspense that I enjoy so much from him and I found much of the story to be obvious and uninspired. 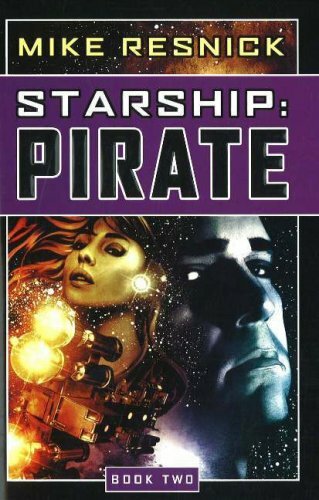 But… there is a reason to read this book, so that you can move on to the second book in the series Starship: Pirate which a solid work of fiction and brings in a little more of Resnick’s sense of humor. The date is 1966 of the Galactic Era, almost three thousand years from now, and the Republic, created by the human race – but not yet dominated by it – finds itself in an all-out war. They stand against the Teroni Federation, an alliance of races that resent Man’s growing military and economic power. The main battles are taking place in the Spiral Arm and toward the Core. But far out on the Rim, the Theodore Roosevelt is one of three ships charged with protecting the Phoenix Cluster – a group of 73 inhabited worlds. Old, battered, some of its weapon systems outmoded, the Teddy R. is a ship that would have been decommissioned years ago if weren’t for the war. Its crew is composed of retreads, discipline cases, and a few raw recruits. But a new officer has been transferred to the Teddy R. His name is Wilson Cole, and he comes with a reputation for heroics and disobedience. Will the galaxy ever be the same? ©2005 by Mike Resnick; (P)2008 Audible, Inc. I rate this book a 5 out of 10 and recommend you read it for the background of Starship: Pirate. The world that Paolo Bacigalupi has created is a fantastical one, capturing the world in the midst of great change. In it we are shown how even though everything is changing culture does not change as fast as the world around it. Jonathan Davis does an amazing job narrating this story; I am totally blown away by his performance. He fills the characters with so much life, making them each a vivid character with their own desires and fears. His ability to create a palpable difference between the different Asian cultures is fantastic. 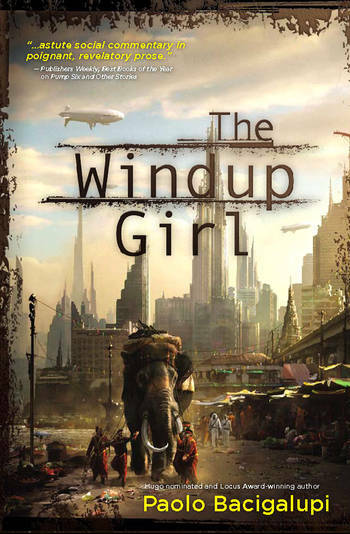 I really enjoyed the science fiction aspects of this story, the new words, the blending of different languages, new creatures, and most of all interaction between the different characters. Every character expresses their desires and fears as the story moves along at a perfect pace, almost all of the characters are both hero and villain, living in some shade of gray. Good stuff. ©2009 Paolo Bacigalupi; (P)2009 Audible, Inc. I rate this book a 9 out of 10 and the performance a 10 out of 10. I recommend it to anyone who enjoys science fiction.